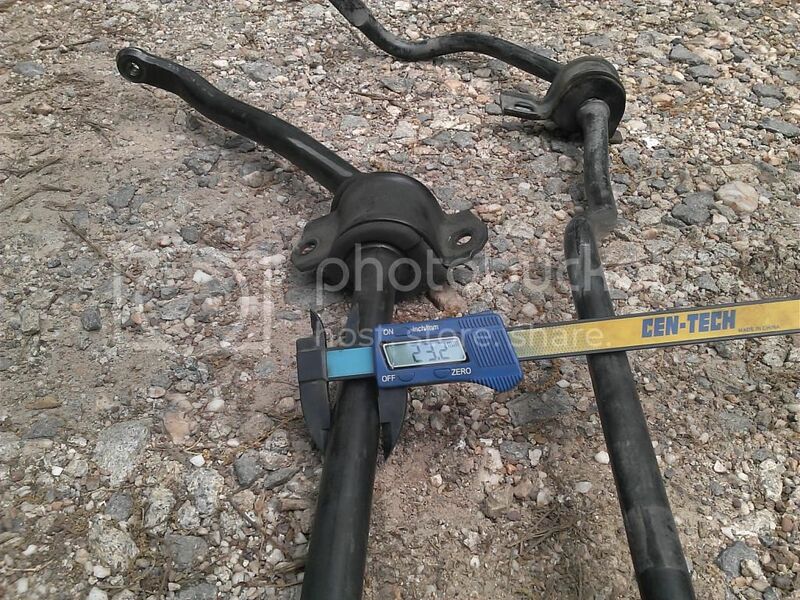 The rear suspension setup is very important for a FWD Autocross car. The stiffer the better almost to the point where it starts to make the car over steer. However, I need to find the balance between good handling and streetability because I drive this car 50 miles per day. I want a sports car ride, not a log truck ride. 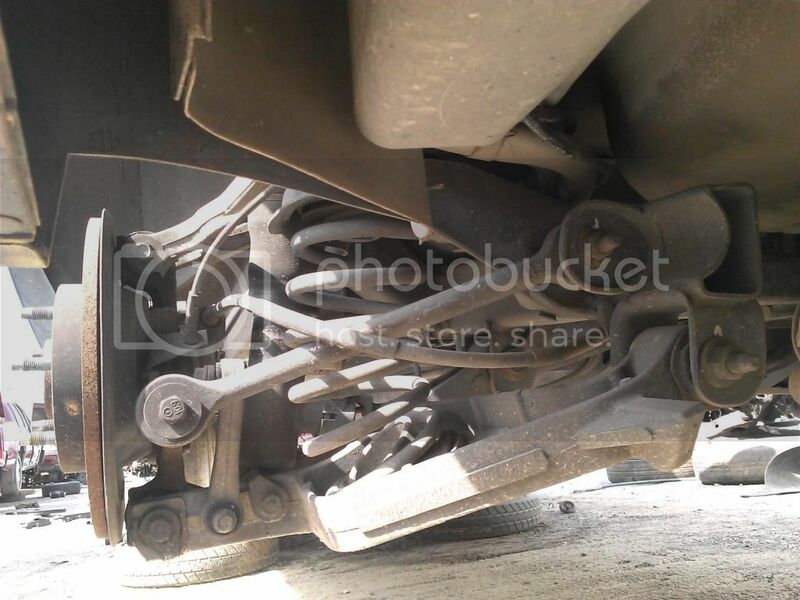 Here's a look at the stock suspension. However, there are a few things about this donor car that make it a rare a desirable find. The base Eldorado and the Sport Coupe as well as the Seville SLS come with a stock rear sway bar of 14MM in diameter. The Eldorado Touring Coupe and Seville STS come with 16MM rear sway bars, which are twice as stiff. This donor car is a 1997 Seville with the FE3 handling pkg. and the computer controlled suspension, which means it has the larger diameter front and rear sway bar. However, this car is special and I have only seen two others like it during my seven year in depth study of these cars. 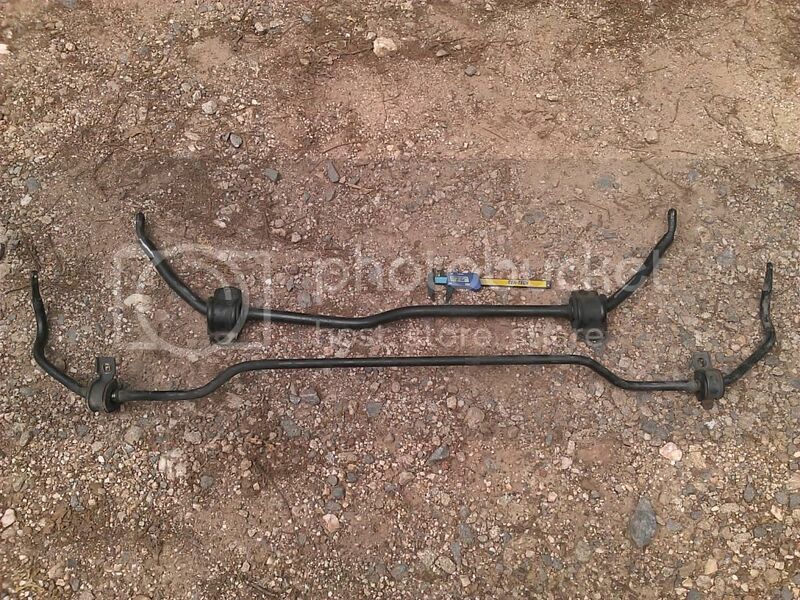 This car has an 18MM rear sway bar which is 4 times as stiff as my stock bar. There is a little-known option, "Sport-Performance Suspension" that apparently included stiffer front and rear stabilizer bars. 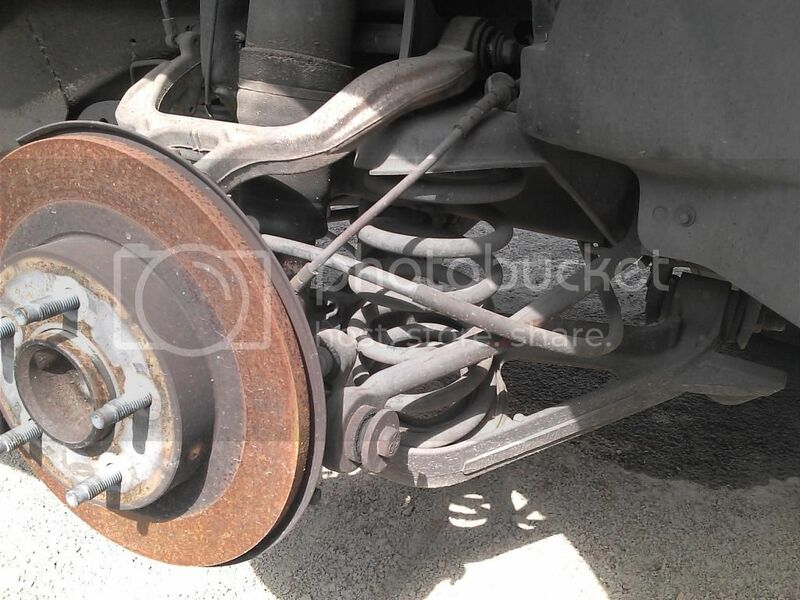 The part numbers for the 1997 ETC are front 29885266, rear 29885266. The front stabilizer bar is unobtainable so I never got either. I don't know what else was in the package, but I suspect that if there was anything else it was reprogramming the PCM to use the stiffer shock setting on steering wheel angle and lateral acceleration as well as on speed or wheel motion. -- See my CaddyInfo car blogs: 2011 CTS-V, 1997 ETC Yes, I was Jims_97_ETC before I changed cars. @ Jim: Thanks for the information. This car does have the bigger front bar 7/8” (or 22.3MM). ADDCO manufactures this size bar for the car and I read somewhere that they may be a manufacturer of OE bars, so it could mean that they produced the bars used in this option. My challenge in retrofitting these bars is that the parts stores do not carry polyurethane or even OEM rubber replacements. If not for the tapered shape where the bushing is attached, I could modify universal bushings. I have one source checking to see if ADDCO would supply “bushings only” for the front bar, but that would depend upon the inner shape. If they were the OEM supplier, then the bushings would be a match. If I am unable to find new replacement bushings, then I will have to compress-fit the 21MM front and 16MM rear rubber bushings around these larger bars. Lithium grease may prevent them from squeaking for a while, but I think I would just have to live with the noise until I can use the OEM bushings to make a mold; then I would be able to produce polyurethane replacements at will…. Maybe even sell them. Hmmm…. The bars don't move in the busings for the most part, the rubber rotates with the bar - until it wears out. There is an outfit called Energy Suspension that sells polyurethane suspension bushings that probably can help you. Thanks for the tip about ADDCO but I sold the car just over a year ago. 2003 Mustang Cobra weight is 3,075 lbs. Each rear corner: 691.9 lbs. So, the weight of the Eldorado’s rear corners are not that much different than the Mustang. It is a good basis for comparison. However, you can’t just compare spring rates between cars due to the different spring motion ratios. Wheel rate is what must be compared. The spring motion ratio in an A-Arm suspension is (the distance from the spring center to the inner pivot) divided by (the distance from the outer ball joint to the inner pivot). Wheel rate is spring rate multiplied by motion ratio squared (multiplied by the angle of correction- which is not needed in this case since the spring is mounted vertically). The wheel rate for the rear of a Mustang with IRS is approximately 33% of the spring rate. For example, a 600 lb/in spring has a wheel rate of 198 lb/in. The wheel rate for the Eldorado IRS is approximately 25% of the spring rate. So, a 600 lb/in spring has a wheel rate of 150 lb/in. Therefore, I need approximately 800 lb/in spring to create a 200 lb. wheel rate for the rear. If by "wheel rate" you mean the pounds per inch of spring resistance seen at the wheel, I believe that the ratio of that to the spring rate is just that of the center of force of the spring on the suspension arm to the outer suspension knuckle, not the square of it, because the lower suspension arm is a simple lever. There is the cosine factor of the spring axis against the suspension arm that can change a little with suspension travel. The shocks have simiilar equations, and are usually canted in rear suspensions to provide more damping at higher wheel travels in the downward direction. There are other significant variables, too, like where the CG is, and what the moments of inertial of the body about its rotation axes, and what the roll axes are in the front and rear. 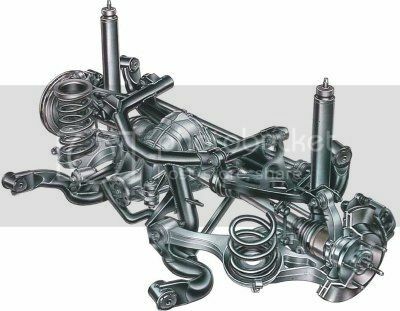 The unsprung weight including wheels, tires, brakes, and 1/3 of the suspension arms, the damping and compliance in the tires, and the location and damping of the shock absorbers. The Eldorado rear suspension SLA geometry controls the roll axis at the rear pretty well. The reason that the Eldorado has a 6" shorter wheelbase than the Seville is to reduce the front-rear weight imbalance. 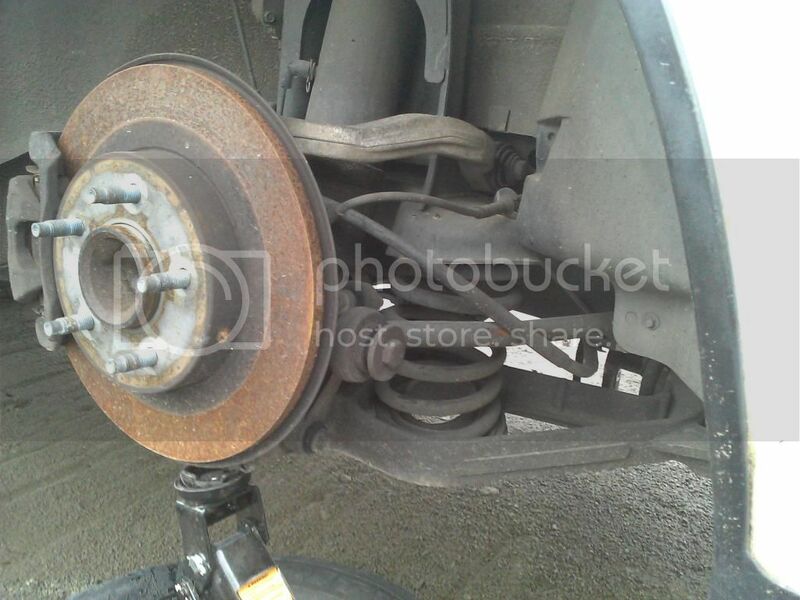 The 1997 and later have alloy rear suspension arms. Strut front suspensions solve a lot of problems by maintaining the steering axis during body acrobatics, because it's just the axis of the strut, and it always passes through the tire patch on the pavement regardless of wheel travel - vastly important for front-wheel drive cars but of essential importance in braking and cornering too. Camber change is well managed because the wheel plane is fixed to the lower strut axis, and rotated about the strut axis by the steering arms ("Ackermann arms"). I think I see my error. I was thinking that a spring half way down a suspension arm, with a lever ratio of 1/2, would give half the force at the knuckle, thus half the spring rate. But the motion is twice as much, and the force is half as much, ergo the force per unit distance at the wheel is the square of the lever ratio. Sorry. Lowering springs are 450 lbs. variable rate and can be used on stock struts. not much weight difference per front wheel than on the Eldorado. Might be a good starting point. 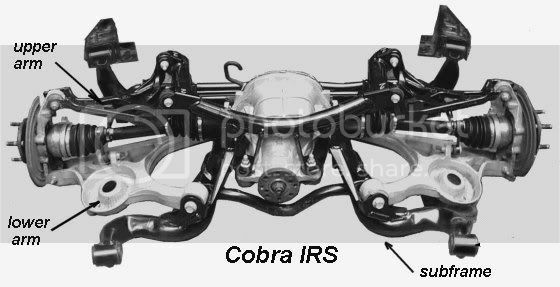 Note that the Cobra's lower rear sway bar mount is close to the center line of the spring meaning it must fight almost all of the rebounding force of the spring. 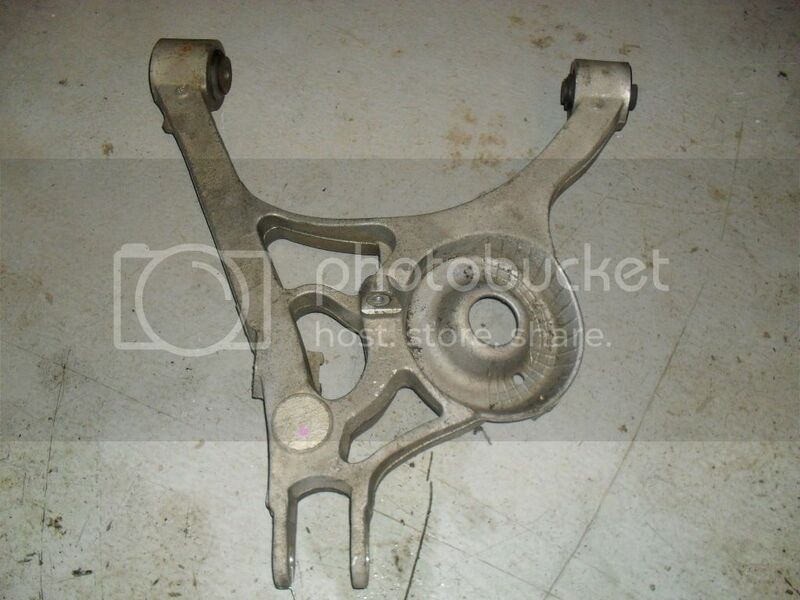 However, the Eldorado /Seville sway bar mount is almost at the end of the A-Arm. This gives it a huge leverage advantage. My 18MM bar should act like a much thicker Mustang sway bar. The Cobra's lower shock mounts and the Eldorado / Seville's lower shock mounts are closer to the end of the A-Arm and about the same distance from the wheel. Therefore, if I use the Cobra's Bilstien shocks valved for its 600 lb. /in. springs , it should be plenty capable of handling the planned 800 lb. /in. springs for the Eldorado since the wheel rates will be cloe to the same. However, the Bilstien's are $150 each so I am looking for a less expensive alternative that doesn't downgrade the modification. I have ordered some shocks that should work well, but I will wait until they come in and I verify that they will work before I post info about them. In both cases I will have to fabricate spacers because the Eldorado shock lower sleeve is longer. Your lower A-arm looks like it has more strength-to-weight because it uses I-beam cross sections in the beams, while the Cobra uses solid square bars. I looked at the ADDCO offering and it does look like they have a 7/8" (22.25 mm) front stabilizer bar. They reference a Note 7, but I can't find the catalog notes anywhere on the web site. Perhaps a PDF of the whole thing would be helpful, or if someone had a paper catalog. The Sport & Performance stabilizer bars you located on a recycled car are probably your best option because ADDCO doesn't offer a rear stabilizer bar to match. When I was looking for the Sport & Performance stabilizer bars about two years ago, I found that the rear stabilizer bar, GM part number 25659242, was still available in warehouse stocks, even though long discontinued by GM. Please verify the part number. I just did a little looking myself on the rear stabilizer. They come color coded, green (FE1 "Soft Ride" [NONONOOOO], 14 mm (9/16"), part no. 25659244), blue (FE3, size not given, part no. 25659242) and red (FE3, 16 mm (5/8"), part no. 25659243). 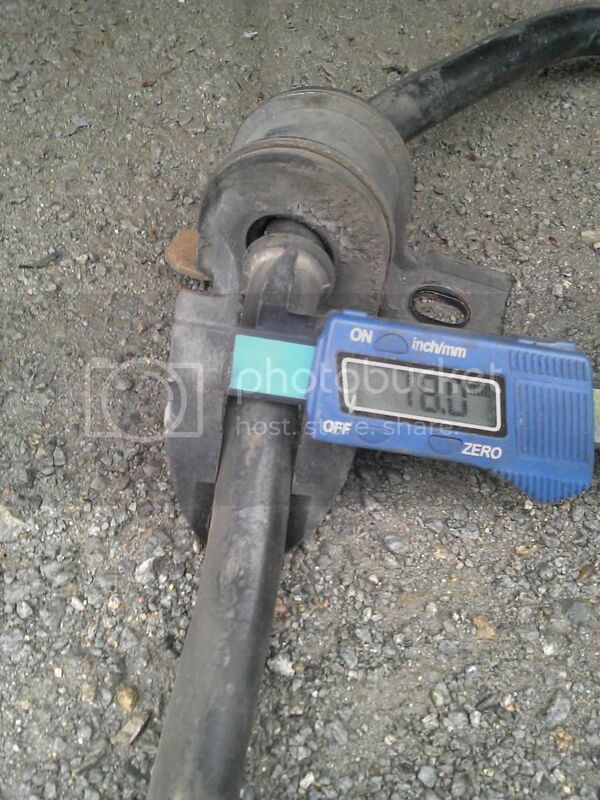 If the 25659242 is 18 mm, it is probably a good match to the ADDCO 22 mm front stabilizer bar. The stabilizer links don't need upgrading. 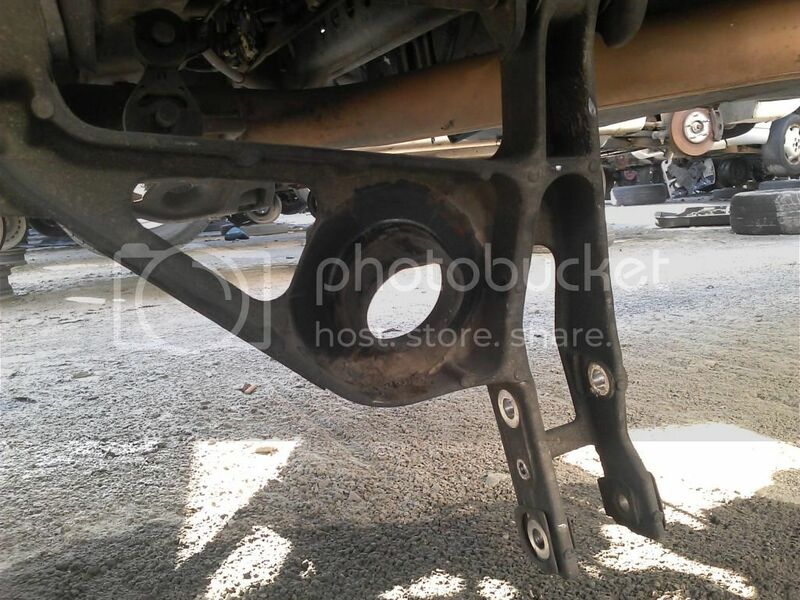 As you know, the front stabilizer links are compressed bushing on the frame but ball joints, permanently lubricated, on the stabilizer bar end. The rears are alloy H-beam links with molded-in bushings 90 degrees apart. That's probably why ADDCO doesn't offer links for the Eldorado. I can only wonder why they don't offer a rear stabilizer bar; perhaps their testing shows that the Eldorado didn't need one in the rear. But their "How Stabilizer Bars Work" blog is very look-this-is-what-it-is with absolutely no hint of suspension compliance and its effect on tire traction, roll center change, etc. and attributed everything to weight transfer - which actually increases with stabilizer bars and other handling improvement measures, which achieve better body control through decreased suspension compliance. Rock Auto offers stock and stock-like rubber stabilizer bar mounting isolators (or, "bushings") for different stabilizer bar sizes. On the Eldorado page, they sizes go up to Escalade sizes, ( 19 mm through 31mm; I see 21 mm for the front but nothing for the rear! ), so an appropriate rubber mounting isolator for 18 mm and 22 mm bars should be there. Thank you for the info, Jim. I will check my sway bar part numbers and color code tags. I know that the end-links do not need upgrading because they act like ball joints; it is the rubber bushings I am wanting to upgrade because as they flex with compression pressure. 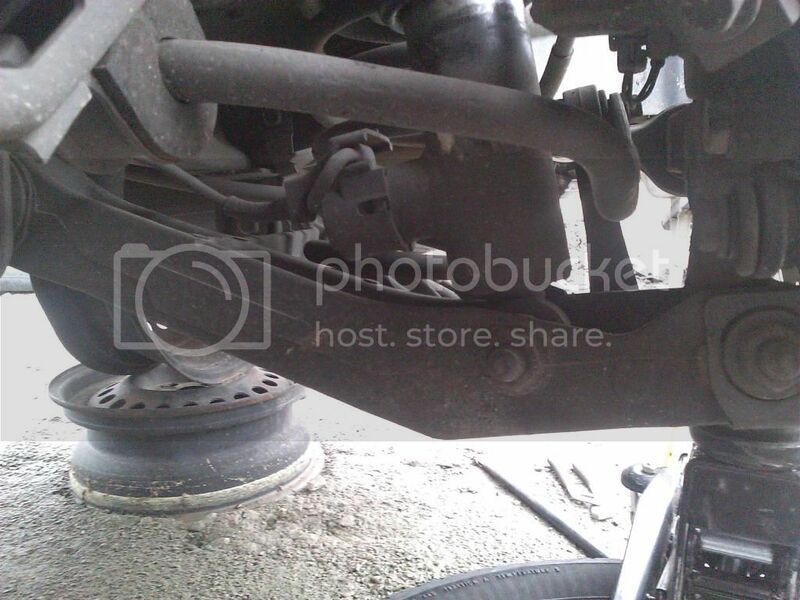 Under force, the sway bar tilts some due to bushing flex. The stiffer the bushing, the less deflection, and the more efficient the sway bar is. Rubber "off-gasses" (deteriorates) over time and becomes much weaker. The 7 year old bushings will flex much more than the factory intended instead of remaining in place and forcing the lift of the inboard wheel as much as it could. I don’t want my 18MM sway bar to act like a 14MM bar because of dry-rotted rubber bushings. 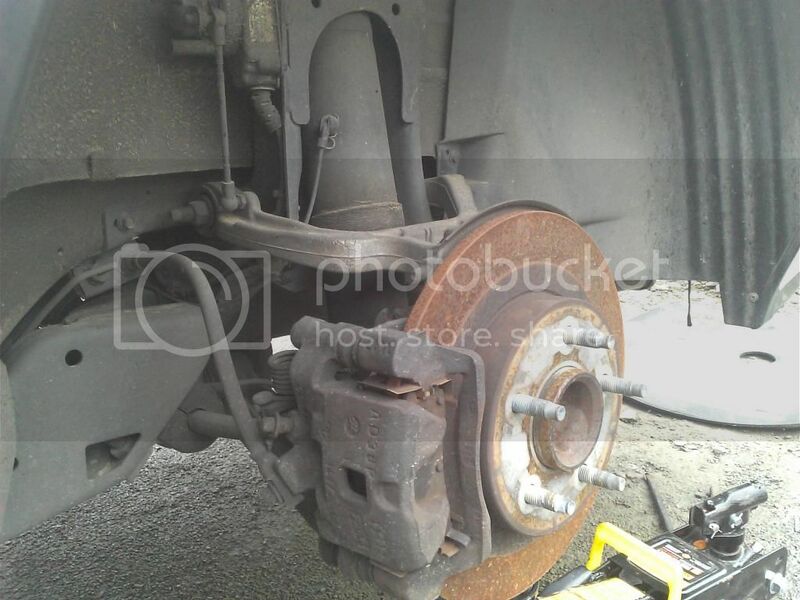 I found the donor car for my rear springs; they will have to be cut to fit…. 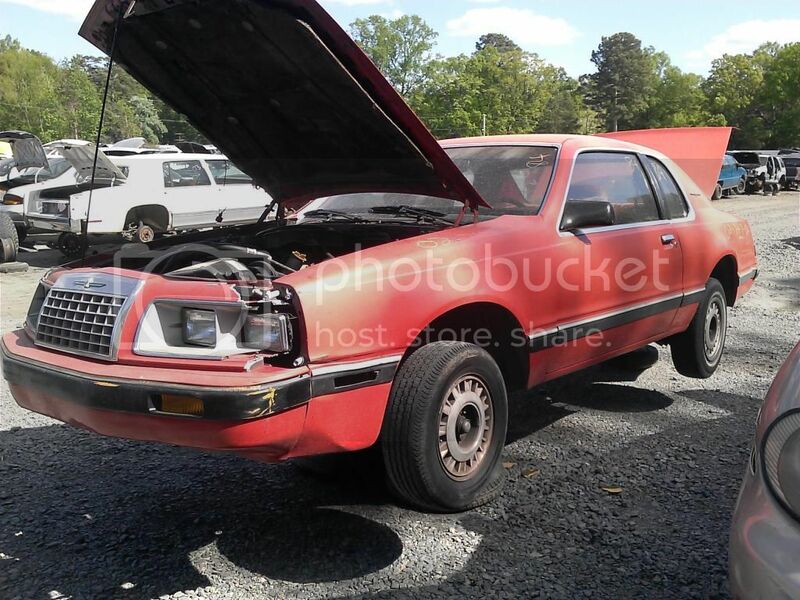 This is a 1984 V6 Thunderbird. According to Moog, the stock springs are 489 Lbs. but they are very long making plenty of room to cut them down into much stiffer units. 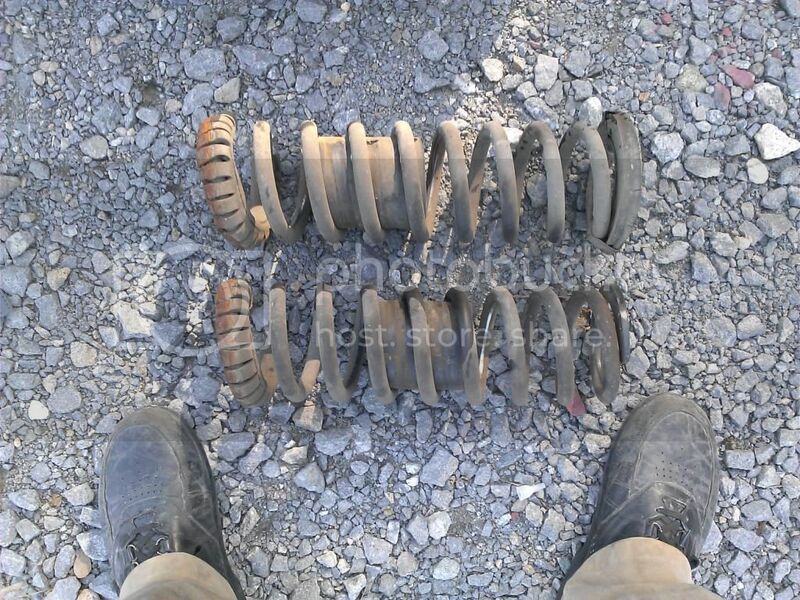 Here are the springs… WOW, there was a lot of energy stored in them on the car. Be careful removing them! Here is one of them compared to the FE3 spring in the donor Seville with the special handling pkg. I could not find info on the spring rate, but the Moog Cargo control spring is 279 lbs./in. and the air ride eliminator springs are variable rate between 315- 430 lbs. If I cut 3 full coils off of the Thunderbird springs, they will be at 811 lbs./in. I just don’t know what the ride will be yet. Interests:Cadillacs with V-8s ,restoring vintage farm tractors and raising Black Angus cattle and shopping at flea markets!!! Once I got past the blasphemy of putting Ford parts on a GM car I believe this should work fine. Those are some large diameter coils. As far as the ride you know it will be much firmer,but that is part of what you are after. I think you are on the right track, keep us updated. Do you have a way to measure spring rate? It's easy enough to measure the rate near full extension, by holding the spring upright on a scale, measuring it, putting about 100 pounds on it and measuring the compressed length and looking at the actual difference in weight on the scale. The rate will be higher at installed height. You can measure wheel rate more easily, by putting the car on jack stands and putting a scale on a floor jack under a wheel, and measuring the wheel height relative to the fender well at two different weight-at-the-wheel settings. This can get you wheel rate at the installed height. Or, with a scale flush with the floor as are those intended to measure weight on a wheel, measure the weight and wheel height, then add 100 pounds or so (200 pounds in the trunk for rear wheels, on the radiator support for front wheels) and measure the wheel weight and height again. Had a nice surprise when I measured the sway bar today. I had remembered it wrong. It is 23.2MM not 22.3MM. I could not find any part numbers on them. But the rear bar had two green hash marks painted on them. 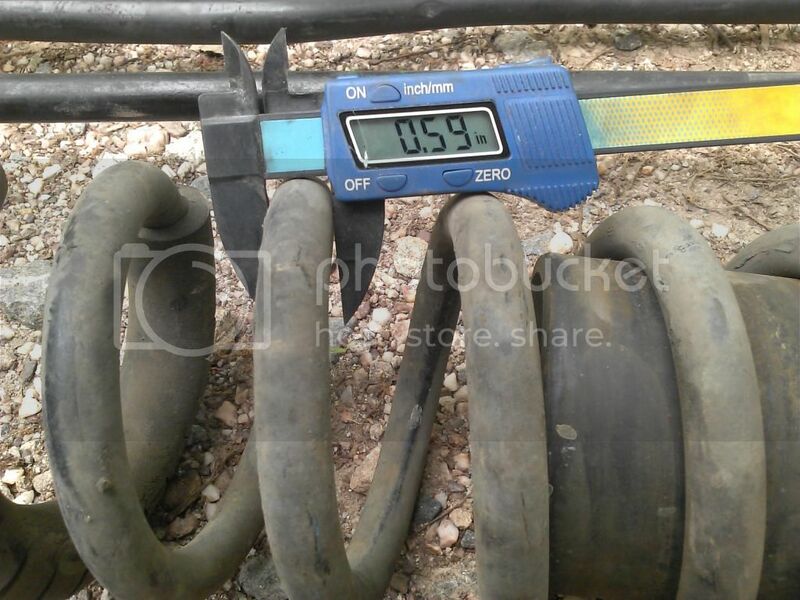 Disappointed; when I measured the diameter of the coil spring wire instead of using the data supplied by the Moog problem solver, the spring that came off of the car was weaker. 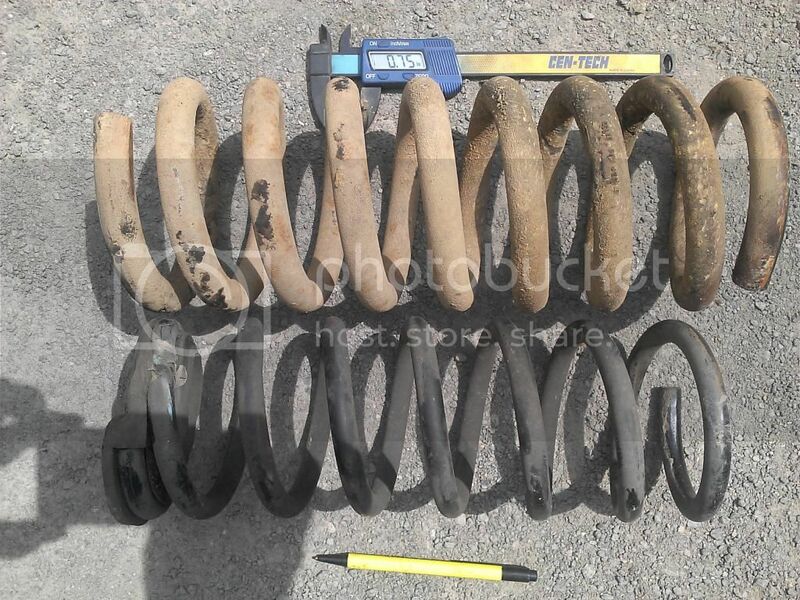 The coil spring calculator shows that this one is 303 lbs. /in. I and if I cut 3 coils off, it will only be a 500 pound spring. Red (FE3, 16 mm (5/8"), part no. 25659243). I did some more looking and found that the Blue 25659242 is from GM Performance Parts. If your gauge doesn't show 14 mm, then my data isn't applicable. Jim, this is too funny.... I took a second look at the rear bar and found the glue residue from where the part number tag used to be. Next time I am at the donor car, I will look to see if I may have scrapped it off when getting the bar around the exhaust system.... Next, I looked at the green hash marks and saw that it looked like they had been hand painted with a parts marker pen.... Then it hit me... DUH!!!! I just bought it from a salvage yard and that was their markings!!! LOL!!! I had to laugh at myself over that one. As far as springs are concerned, I wanted to answer the question; "where's the beef? " So, armed with a digital caliper and tape measure, I went on a hunt for the strongest coils I could shoehorn into the spring pocket. The maximum outside diameter that will fit is 5 and 1/8". 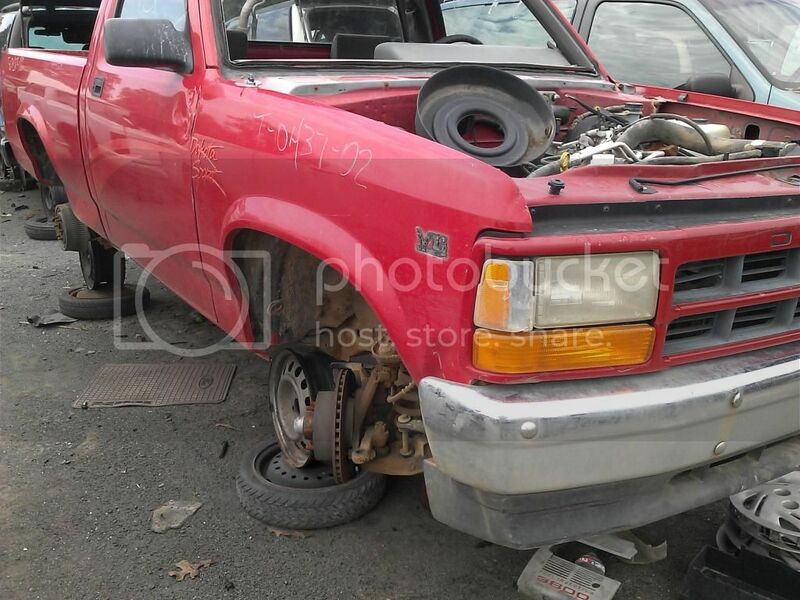 I found that under this Dodge Dakota Sport truck. Forgot to mention that my minimum inner spring diameter had to be 3.5" to clear the holding tabs in the pockets. Anyway, these springs have massive coils that are 3/4" thick! I am going to have to run the numbers again and figure how much to cut out of the spring to get the ride height I want. 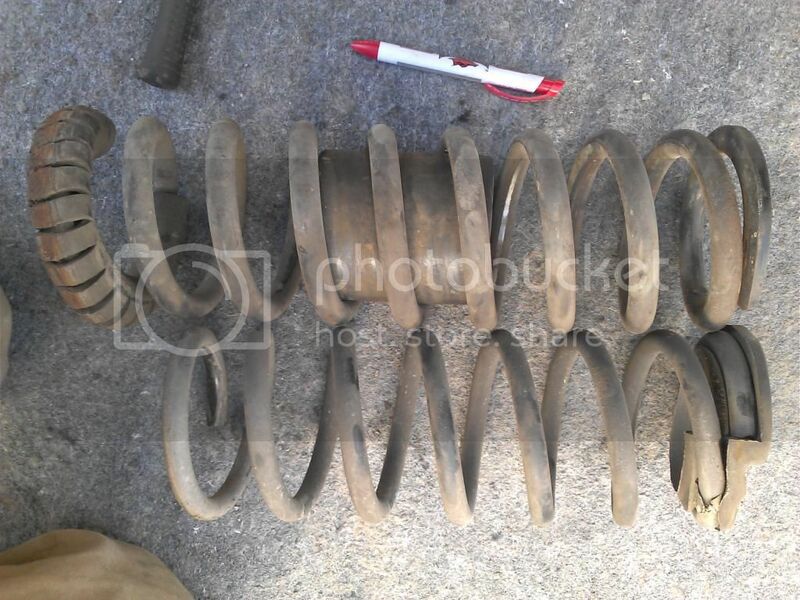 Depending on how many coils come off, the spring will be somewhere between 850 lbs. and 1,025 lbs. The Mustang lowering springs for the Cobra IRS are 800-1,000 lbs. and I need more than 200 lbs. extra to make the same wheel rates, so I am well within range no matter what the outcome. Now to clean these bad boys up and give them a fresh coat of red paint.